A Pittsburgh company changes its focus from furniture design to architectural millwork in order to survive the economic downturn after 9/11. Shop/Office size: 10,000 sq. ft.
FYI: Craig Elias has a journalism background and initially started out in the woodworking industry as a furniture designer. Elias Studios has transformed over the years from a company that once downplayed CNC technology to a company that now embraces high-end equipment to remain competitive in a steadily changing landscape. "Our ability to design and sell furniture took a dramatic turn for the worst following September 2001," Elias explains. "We were in the process of having to sell the equipment, [but we were not able] to get a decent price for it because everyone else was going out of business too." However, the outlook brightened when jobs started to trickle in, he says. Only they were not furniture jobs, but requests for architectural millwork. Acquaintances of existing clients provided Elias Studios with a means of survival. "These were good, profitable jobs," Elias says. For example, in 2002 the company agreed to fabricate millwork for a local bar, and then someone who needed a wine room saw that work. So the company also fabricated a wine room in the New York area to accommodate 1,300 bottles. Elias says that the owners were so impressed with the quality of the work that they now account for approximately one-third of the company's sales. "And before we knew it, we were back in full swing." The library pictured above was fabricated for a house in Connecticut. It features quarter-sawn white oak, arched and vaulted cubbies, curved raised panels, mouldings and solid wood. Elias Studios reinvented itself by turning a golfer's swing into a batter's stance - a different game with different techniques, but with the same goal of hitting a small ball for a long distance. Reinvention is not an unfamiliar theme locally. Pittsburgh, well known for its steel production, also went through a turning point during the 1970s when its huge steel plants, as well as other manufacturing plants, closed down, leaving a severely battered local economy. Through several renewal phases, the city eventually evolved from a manufacturing driven economy to one based on information and services. The willingness of the city to embrace a new philosophy for economic growth allowed it to prosper. Likewise, Elias' willingness to adapt to the changing environment allowed his company to survive difficult times and position itself as a company with a new niche market and a new appreciation for high-end technology to help it succeed in that market. One key to success is to imitate those companies which are already thriving. Once Elias embarked on a new direction, he needed to know what other architectural millwork companies were doing to be successful. An architect agreed to take him on a tour of companies in New York and New England to see how those companies were run and how their shops were equipped. The library above was fabricated to match a kitchen designed by a world-famous architect. A custom vacuum press was made to accommodate the 141?2-foot ceiling panels. It has cherry veneer and 13 different custom profiles. "It became pretty obvious that high [end] technology played a big role in the more successful shops," Elias says. 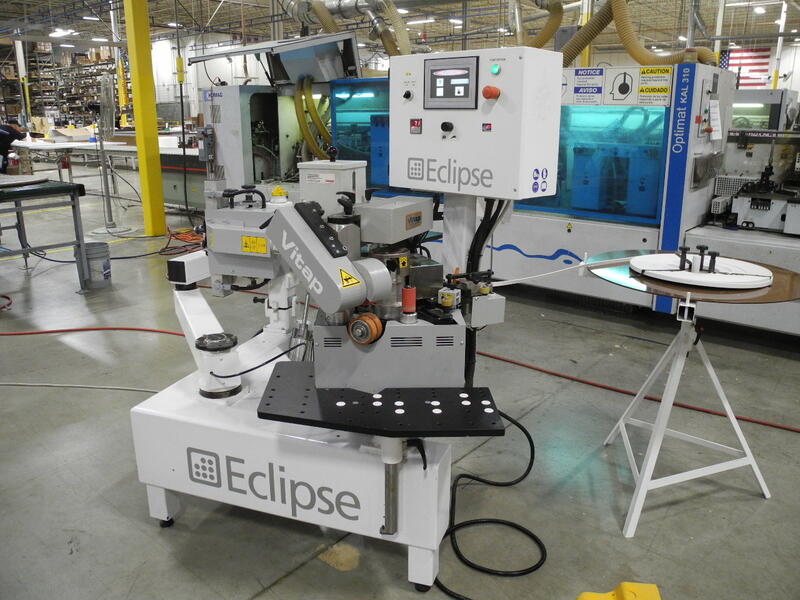 So he decided that in order for the company to grow and take on extra work - and to deal with a narrow pool of skilled labor - he had to invest in CNC capabilities. Elias also decided to develop an in-house moulding department, and he joined the Architectural Woodwork Institute. "That made a huge difference, too," Elias notes. "It brought exposure to how other shops were doing things, [provided] seminars, literature and [allowed us to] compete at a different level." 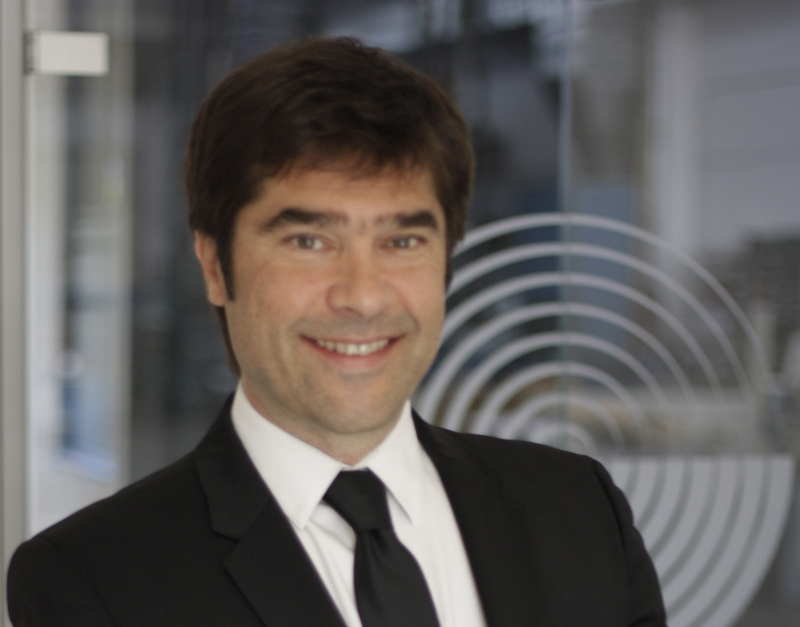 Armed with this new information, Elias generated a business plan with a marketing proposal, sales projections and everything needed to set the process in motion. "[We figured out] what it was going to cost us and what we were going to do," Elias says. "We bought the moulding equipment used and the CNC equipment new." Elias first started exploring options in April and May 2004 and made a decision to purchase the CNC in September 2004 following the International Woodworking Fair, held in Atlanta, GA. He decided to purchase the Weeke Optimat BHC 280 3/12 from Stiles Machinery. With the help of John Metzler, project manager, the company's furniture showroom was torn down to make room for the new CNC machining center. Metzler says that his first assignment for the company was constructing a plywood wall separating the office from the expanded shop floor. Initially, Elias says employees were a little nervous about the CNC and wondered if it would replace them. "Time had to prove to them the fact that the CNC wasn't there to replace them, but to make their lives a little easier and, more importantly, to secure their jobs, because it allowed us to be competitive and take on jobs that we otherwise would not have had time [to do]." While most of Elias Studios' recent machinery additions were the result of carefully planned purchases, one was the result of industry knowledge and a little luck, too. Craig Elias won an Altendorf F-45 sliding table saw for his participation in Altendorf America's trivia contest. 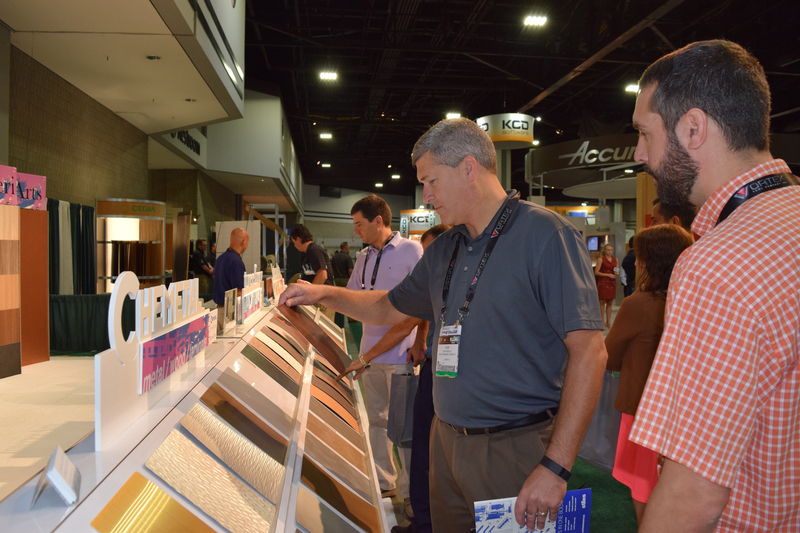 All winners of the Altendorf America Trivia Zone were announced at the 2005 Association of Woodworking Suppliers Fair (AWFS) held in Las Vegas. "I saw in one of their e-mails that there was a trivia contest and a chance to win an edgebander, a sliding table saw or a widebelt sander," Elias says. "I thought 'What was there to lose? I'll do this.'" The daily contest was held online. Elias says everyday he received an e-mail response telling him whether his answer was correct or incorrect. "It gave me an opportunity to log in and answer the daily question. I just did that everyday. It was a fun contest to do." Elias' resource for the trivia answers was the various trade publications he reads. "I try to keep up-to-date about what's going on [in the industry]. I wouldn't say that I knew all the answers, but it was a matter of persistence. It was even more fun to find out that we won." According to Elias, the CNC allows the company to respond quickly to its customers' needs and to operate in a lean fashion. It can produce parts as needed to assemble and work in small batches so that other areas in the shop are not overwhelmed. A recent project for a library in a Connecticut home illustrates how quickly the company can now respond to a need. 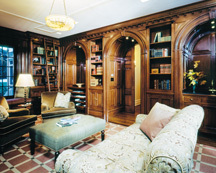 The project consisted of quarter-sawn white oak, arched and vaulted cubbies, curved raised panels, mouldings and more. "Everything had been thought about in this house, except the one thing [the builders] forgot, which was the casing on this [library] door," Elias says. "All we had to do was one room - everything else was paint-grade. It was the day before they were handing the house over to the owner, and there was no casing for [the door]. They knew we had the dimensions, and they know we had the knives for the profile to make the curves. So they called and asked if there was any way they could get the casings for the other side of the door by [the next] morning. "They called around 11 a.m. and immediately a draftsman exported the code to the CNC machine," Elias continues. "The machine operator started making the templates and the jigs. John set up the shaper with the knives to run all the profiles, and someone else started gluing up the material. By 4 p.m. that day, all the casings were crated and being sent FedEx for an 8:30 a.m. delivery to Connecticut, so they could have it and hand the keys over to the customer in time." Elias says that they never would have been able to do that without the teamwork from his employees and the new CNC and moulding machines. Elias Studios fabricated the truss work above the pool with its CNC machining center. As the company grew, Elias says he realized that in order to complete some of the jobs coming in, he would have to subcontract some of the work. "We didn't have the capacity in-house." However, the company ran into quality control issues, as well as scheduling problems. "So, despite the trend to outsource, we've tried to bring as much [work] as possible in-house to become a fully vertically integrated shop," Elias says. As a result, the company added a hot press (ItalPresse SCF/6) and a veneer saw (Scheer FM 5-3100). "We now bill ourselves to our clientele as their one-stop comprehensive millwork provider. We control the quality, and we select the material. We provide the comprehensive millwork package," Elias adds. Other equipment in the shop includes, an Altendorf F-45 3400 sliding table saw, SCMI SuperSet 23 five-head moulder, Mikron M-645 arch moulder, Mattison 202 straight line rip saw, Delta 43-791 shaper and SCM T-120 shaper, Timesavers' widebelt sander and a Kremlin air-assisted airless finishing system. Elias Studios fabricated a wine room to accommodate 1,300 bottles. This project jump-started the company's foray into architectural millwork projects. Elias says his goal is to be profitable while having fun. "Life is too short for this to be just a job. We try to pay highly competitive wages and keep the work fun and the environment healthy and make a buck while we're doing it." Sales projections for the company this year are $1.2 million. "In 2004, we wrote the business plan, and the intention was to get up to revenues of $2 million a year before we had to move and be able to do that in two to three years," Elias says. "We're on track for that. We felt that if we added the equipment, we could handle the turnover and empower [our employees] to do their jobs. It's working out fine."